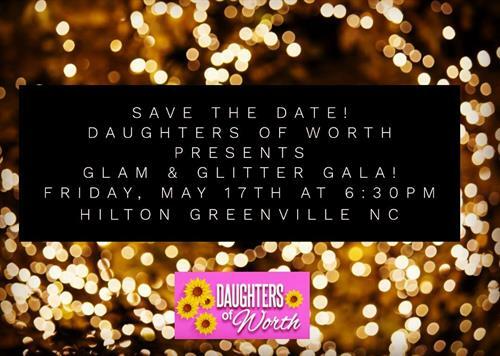 It is with great excitement that we announce that on Friday, May 17, 2019 at 6:30pm, Daughters of Worth will hold its’ inaugural GLAM & Glitter Gala at the Greenville, NC Hilton! This special event will feature a cash bar, delicious dinner, silent auction, and powerful Keynote speaker, Ainee Lynnette Taylor (Former WITN Journalist)! In addition, during this special evening, several of our GLAM girls (Girls Living a Mission) will be recognized for earning the GLAM girl of the year and high school participants will receive our very first scholarship awards! In 2015, Daughters of Worth was founded with a mission and vision to educate, equip, and empower girls of all ages to become strong women of influence in their communities. Beginning with only 12 middle/high school girls, the need for Daughters of Worth became increasingly evident, which today has allowed us to serve over 1,000 girls each month through our six signature programs in 4 counties of Eastern NC! Queen Sponsors – $1000 – Receives 1 Reserved Table (8 Seats). Provides 1 High School Scholarship and 1 Empower Her! Event. (Scholarship and Empower Her! Event is all named in honor of the Queen Sponsor) *Receives Queen Sponsorship for GLAM & Glitter Gala from the podium at Gala, the Daily Reflector, on website and all social media platforms (Facebook, Instagram, Twitter, and Linked In), recognition during the event and logo printed on all upcoming GLAM & Glitter Gala promotional items and program as the Queen Sponsor. Also receives 1 full page promotional ad in our GLAM girl magazine. Princess Sponsors – $750 – Receives 1 Reserved Table (8 Seats). Provides 1 High School Scholarship. (Scholarship is named in honor of the Princess Sponsor.) *Receives Princess Sponsorship for GLAM & Glitter Gala from the podium at the Gala, the Daily Reflector, on website and all social media platforms (Facebook, Instagram, Twitter, and Linked In), recognition during the event and logo printed on all upcoming GLAM & Glitter Gala promotional items and program as the Princess Sponsor. Also receives ½ page promotional ad in our GLAM girl magazine. Crown Sponsor – $500 – Receives 1 Reserved Table (8 Seats). Provides 1 Empower Her Event. (Empower Her! Event is named in honor of the Crown Sponsor.) *Receives Crown Sponsorship for GLAM & Glitter Gala from the podium at the Gala, the Daily Reflector, on website and all social media platforms (Facebook, Instagram, Twitter, and Linked In), recognition during the event and logo printed on all upcoming GLAM & Glitter Gala promotional items and program as the Crown Sponsor. Also receives ¼ page promotional ad in our GLAM girl magazine. Diamond Sponsors – $250-$499 – Receives 4 Tickets to the GLAM & Glitter Gala. Provides 1 GLAM Girl Book Club. *Receives Diamond Sponsorship for GLAM & Glitter Gala, will have Business Name listed on name plate of the book given to GLAM girls for the book club and will be recognized on website and all social media platforms (Facebook, Instagram, Twitter, and Linked In), recognition during the event and logo printed on all upcoming GLAM & Glitter promotional items and programs as the Diamond Sponsor. Also receives recognition in our GLAM Girl magazine. We believe that the work of educating, equipping and empowering the girls of our communities through meeting basic needs, advocating for safe housing, and providing valuable information and resources to serve these girls is necessary. However, we also realize that this work cannot take place without your support. Will you please consider joining us in this fight to advocate for the lives, freedom and futures of the girls of our communities by serving as a sponsor for the 2019 GLAM & Glitter Gala?